This entry was posted on July 29, 2009 at 10:08 am and is filed under Mr. Spaulding. You can follow any responses to this entry through the RSS 2.0 feed. You can skip to the end and leave a response. Pinging is currently not allowed. I haven’t even had time to read the post yet, as I’m at an out-of-town library and about to be timed out. BUT I WILL! Are you kidding? A post about and/or from MR. SPAULDING?!? How can anything from him **not** be interesting?!? Gotta run. Till next time! Ahhh, fond memories of chemistry with Mr. Spaulding. I’m sure I was far from a good student in that particular class but I knew he was a great teacher despite that! I remember when he came out to the farm and with great skill used his chemistry background to demolish a huge tree trunk. When I started my senior year in HS I decided I better buckle down and take a few courses that may help me in college. Back then it was college or the draft. I took chemistry and Algebra II, both taught by Mr. Spaulding. That was his first year at Rolfe and we really didn’t know him. He was the harshest, strictest, most cynical teacher I had ever known. I had thoughts about him that I will not relate here, but those of you who had him as an instructor may also have had. I survived those courses and they helped me more in my first year college courses than I could have imagined. I went to ICCC my first year of advanced education. I enrolled in a chem class and had to study very little because Dave had taught all the things that I needed. That is not to say that ICCC did not have a dedicated class. They did. It’s just that Dave had given college level chem. I gave up on college and went into the military anyway later. I saw Dave a few years later and told him this story and in typical Spaulding fashion he didn’t show any reaction. But he was probably the best instructor I had. First of all I’m still having a hard time imagining that Mr Spaulding is having anything to do with a computer. Not that the ability to maneuver through the computer world would outside his capabilties but more that the attitude toward such a thing would be less than enthusiastic. I have not seen Dave for several years but judging from the picture above I would certainly recognize him. I bump into Mr Pohlman, Mr Durling, Mr Hutchinson, and others still being around town and setting in a place where people seem to pass through when they are in town for something. It is surprising how many times the name Spaulding comes up when reminiscing about high school. Students and facilty were both left with classroom and teacher lounge memories worthy of recollection when conversations turn to school days at RHS. I think in high school I took every class offered by Mr Spaulding and even though I didn’t spend much time in college the classes I took that were extensions of subjects I had with him were made much easier having been prepped by his courses. Even more importantly the classes gave you background for real life situations where you needed some math or science knowledge. I think students also learned the need for good study habits(you didn’t want to not know the answer when called on),classroom etiquette(pay attention and behave or there would be ____ to pay),and most of all respect( no explanation needed) Thank you Mr Spaulding. It would be fun to see you again sometime and I will watch for other comments. As a spouse of a RHS graduate (’74), I’ve heard Mr. Spaulding stories many times over the years, especially whenever Chris Peterson was involved in conversations with Gus. Chris has quite the memory concerning details, dates, etc. and adds his own brand of humor and embellishment to the tale. Gus says Mr. Spaulding taught him to drink coffee during early morning classes, either senior math or physics. (Chris could tell you…and make you picture the scene and smell the aroma of coffee mixed with the natural gas from the bunson burner.) Gus says they heated the water up in a beaker, clean I assume. Everyone had to bring their own cup. Gus is not a coffee drinker to this day, but it was the cool thing to do, to share a cup of coffee with your high school teacher and chums. I’ve also heard that Mr. Spaulding was rather fond of blowing things up…in a controlled environment. In the 80’s, after we’d moved to the family farm, Mr. Spaulding came by to blow out some old concrete for new post holes in a cattle lot. Gus remembers at the time Mr. Spaulding was concerned because there were new restrictions being put on dynamite. Little wonder! He said if Gus could get the dynamite, he’d do any other jobs he might have for him. It was then I learned that you walk away from the lit fuse, not run….just in case you were to trip and not get away in time to prevent bodily injury. It all made sense, the length of the fuse, walking slow but deliberate…but I was still anxious, watching my husband casually strolling away from the lit fuse and listening to explosions all morning. I suspect our livestock wasn’t too fond of the experience either. I’ve heard a nickname associated with Mr. Spaulding’s fondness for things explosive. I asked Gus just now if he thought Mr. Spaulding knew of this. He’s not sure, and he still doesn’t want to “get in trouble” with his former teacher. Similar to you not feeling quite right about calling him “Dave”, Louise. There’s just something about a teacher and authority that probably never leaves you. From the many stories I’ve heard tossed around between RHS alums, I know Mr. Spaulding made a lasting impressionon his students. I think no matter what high school you went to, we all probably had a teacher similar to Mr. Spauling, who gave their students much more than an academic education…just maybe without the dynamite! I can just imagine the entire body of RHS alum giving a collective gasp that I mentioned a nickname. (I’m sure they’re all reading your blog, Louise.) Maybe I shouldn’t have said that. Yikes! I might have just gotten Gus and/or Chris in trouble. I do know that it was nothing durogatory, but used in fondness and respect for Mr. Spaulding. Nothing wrong with explosives, as it didn’t lead any parties involved into a life of crime. The stories I’ve heard are always filled with high school shananigans and fond memories of Mr. Spaulding and others who made those years memorable. Peg (Gunderson) Moore here. Class of ’69. I had you for Chemistry and one or two of the Algebras. I’m really looking forward to reading whatever you feel like writing or talking about! And . . . were you just naturally confident right from that first school day with us . . . or did you ever have any qualms you didn’t let your students see? I’ll write more later. Maybe some more questions. And almost surely some remembrances. I’ll give you a clue, though: You were much less intimidating to me at our (20th?) class reunion at the Allen Bud Barn in Rolfe than in 1965 (my first year in high school)! Your readers are all at attention! I entered the Rolfe school system in the fall of 1965.
checked the want ads and Rolfe was the closest one. the time, I was 38 years old. much curiosity about my new students. and Nancy. Surprisingly, none were vitriolic! Vitriolic: That sounds like a good chemistry and/or explosives word! 🙂 No, I can’t imagine any comments here about you will be “vitriolic”! So . . . my next question, then, is: How in the world did you gain your confidence, if you had it pretty strongly instilled already by the time you came to Rolfe? Was it from your family-of-origin years? Or from later years before Rolfe? A few details, please! It’s amazing to see someone of your confidence (as evidenced in what you tried to instill in us **in addition to** the academics) as a new teacher in a school. Where did YOU learn the respect, attentiveness, discipline, etc. that you turned around and tried to instill in us/how did those qualities become so important to you/and how did they become so important that you set out to pass them along to your students? These are all good and common memories. I took all the courses offered and every one of them paid off in college and life. I remember a fellow student asked Mr. Spaulding his opinion on a news story where all the planets in the solar system were about to line up and the possible consequence of collapsing orbits and the end of life on Earth. Mr. Spaulding provided the life lesson of just because you see it in print does not mean it is true, and that this planetary alignment had happened many times before without consequence. I often wondered if he could make this statement from reading about it or first hand experience. I also remember the classroom was like no other room in the school as if it belonged somewhere else. The wonderment as a freshman of this feature rich room with chemistry tables, a shower, cubbies and drawers. I also have color memories: a giant black slide rule hung above the black board; the white Comet; the brown/grey CRC handbook chemistry and physics of just the right height to lean on (so stated by Mr. S.); the green leisure suit (when they were in style); and the colored plastic dinosaurs to identify (complete with the names stamped on). My brother was disappointed Mr. Spaulding left RHS during his time there. We still laugh about the reading and delivery of the test grades. Mr. S. would ask each person individually if he or she wanted to know the grade received. He, of course, would read the grade letter aloud for all to hear – the longest letter of all was: EFFFFF. I have more memories for later. Thank you Mr. Spaulding for your impact. And good luck on your retirement job of breaking into all our online accounts and answering the favorite teacher security questions. Some singular memories I recall regarding our reknown science teacher. 2. It was fall, 1972. Playing Nixon, I had to debate Doug Christensen (who had drawn McGovern), never an easy task, and before the student body. You couldn’t fake it with Doug (I tried to fake it nevertheless). Anyway, after the debate, where both of us just plagiarized portions of their speeches we found in newspapers, Mr. Farley or someone suprisingly OPENED UP the floor for questions. I felt like opening up a wasp nest on his front porch. (Hi Coach Farley.) And Hi Doug. …Now that I think about it, I plagiarized. Doug probably studied hard and gave the speech from his heart. Ok, ok, we’re getting to the point. So Mr. Spaulding raised his hand. I theorized that Oh, this is what a meltdown is …or a seizure. I’m pretty sure I overheard Doug mumbling something or another, like he could. But on perhaps the luckiest day of my life to that point, the question was for Doug. I was grinning huge in my intestines, and was delerious with joy. So I’m not sure of anything after that. But I wasn’t sure Spaulding liked Doug (at least that’s what Doug always told me), or else he had it in for the Jefferson/Jackson Party, as that Watergate(?) question, of all things, if I recall, somehow didn’t seem to help Doug very much. And I recall thinking Me and Spaulding are on the same side! (never mind what the facts were). 3. I think I majored in Earth Science in college a good deal because of Mr. Spaulding. (Plus I didn’t like college , so I was looking for an easy exit, and knew I wouldn’t have to study Ea. Sci. very hard. I was right.) Some high school hired me anyway. And since, I’ve patterned much of my teaching style after Mr. S., especially the once-a-month “science discussion” days where I let my students ask anything–in the universe (science related)–they wanted. I graduated in 1970 and took all courses offered by Mr. Spaulding. Hands down the best teacher I ever had. I majored in Math in college and was about 1 1/2 yrs. ahead of the other freshman. He got every drop out of a student he could. He could be heavy handed, but I ‘ve seen him be very caring. I’m glad he is getting the recognition he deserves. He must have mellowed a lot because he didn’t drink coffee with us. I can’t even imagine that. A couple yrs. after H.S. we frequented the same pizza place. While his wife grocery shopped we’d have a couple beers. There he was just Dave. The guy next door. In the late 70’s I stopped in Bode. I wanted to say Thanks. He invited me to sit in on the class. Good time. FYI Be careful where you use some of those explosives Mr. Spalding taught us. He never said a thing about laws that might discourage such experimenting. Had dinner with my folks tonight and my mother has a Mr. Spaulding memory I think deserves posting. He used to keep a piece of rope close for any male student who wasn’t wearing a belt. I know what some are thinking, but a student did whatever Mr. Spaulding ordered. I had forgotten about the belt policy until reading your comment, Jim. But, now that you mention it, I remember the school policy was that male students had to wear belts. Some jeans that students — male and female — wear today could certainly be held up better with a belt…or a rope! As Jim said, we had a family gathering on Father’s Day. We somehow got onto the subject of Mr Spaulding and Jim told me about this site. My memory is the sheer fear of walking into your first freshman earth science class. EVERYONE knew what time that class was. Funniest memory I have is Jeff Loxtercamp falling asleep during one of Mr Spaulding’s slide show films. Don’t you remember the ones that used a beep sound to indicate to move to the next slide. Well, lets just say Jeff must not have had coffee with Mr S. that morning and he fell asleep. Mr S. woke him up rather quickly with a jar of amonia. God, that was funny! I now have 4 children and only wish they had teachers 1/2 as great as Mr S. was. I did not take any of his classes other than earth science, probably out of fear….but I did learn in his class and especially respect for the instructor. Thank you Mr Spaulding I hope you know the great impact you have had on so many lives. Liz, I appreciate your letter. I never told the students my unspoken motto which was, “Count that day lost that you didn’t give a student heck for something.” I didn’t really follow that motto all the time but it seemed to work on the students. If I may set the record straight, Mr. Spaulding NEVER woke me up during the Earth Science slide show films. I did fall asleep, Mr. Spaulding came close but through fear I woke up just in time before the lid came off the amonia jar. Mr. Spaulding swore under his breath and stalked back to the chemistry storage closet. There are several antedotes from Mr. Spaulding’s classes I still tell to this day. Such as Mr. Spauding’s nickname for me was Speedy, his sarcastic way of saying how quick I was with calculations. Or that I could be the next Einstein, since I usually made up math theorems on the spot. Almost always incorrectly, but creative. Then there is the classic, “Does a chicken have a gizzard? “Um, no.” Do YOU have a gizzard?” “Uh, yes? !” story to a fellow hapless freshman. I took all the classes Mr. Spaulding taught in highschool, somehow survived, and am a far better person for it. I went in an artistic direction instead of science and math, for which the science world is eternally grateful. But the hard work required for your classes made me a far more productive citizen than I otherwise would be. Hope you are enjoying your retirement! 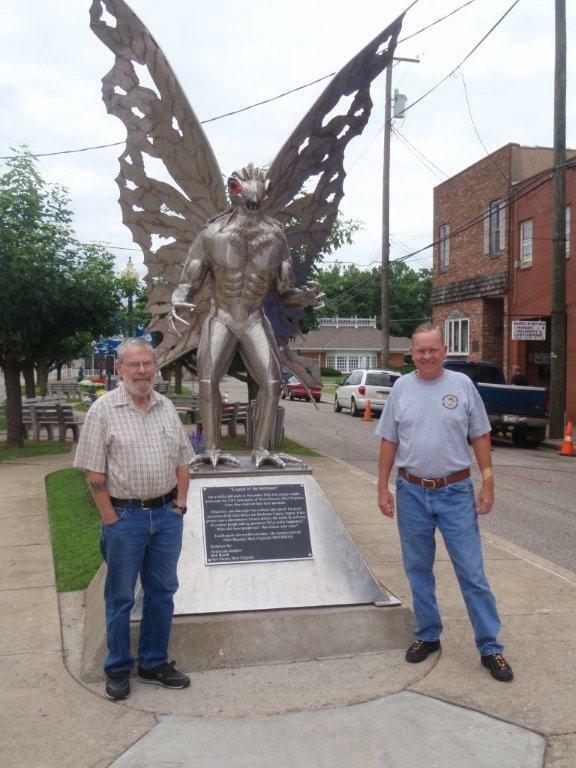 If you ever do find the real Mothman, please let me know. Thank you for your humorous and kind comments, Jeff. About the gizzards, that would come up because they found stones in dinosaurs’ gizzards. As a result, they surmized that the dinosaurs swallowed the stones so they could grind up food in their gizzards. That’s why the stones were smooth and round…from grinding the food. I asked students in the class about gizzards and whether they had one and they didn’t know. I asked, “Well have you ever had your gizzard removed?” When one student said he didn’t know, I said, “You mean you don’t know if you’ve had a gizzardectomy? !” Poor fellow, I don’t know who it was. Just wanted to let you know, Mr Spaulding that my brother Jim, passed away November 7th, 2010. He had been suffering from asbestos exposure and received a double lung transplant on September 23, 2010 in Iowa City. Obviously it didn’t work and we spent over a month watching him go from bad to worse to having to say good bye. I know he was very fond of you and wanted to thank you for the joy you brought to him. We all miss him very much.